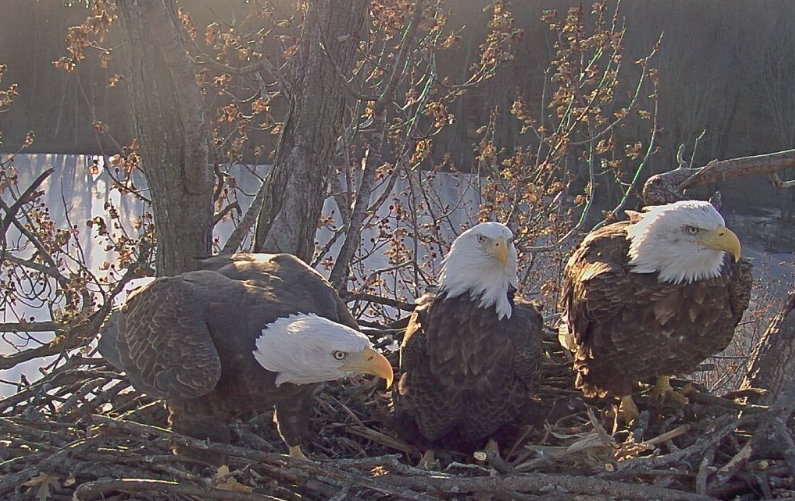 Two male bald eagles near Fulton have found a new, female eagle to nest with. A web camera is mounted above the home of the three eagles. Usually eagles mate in pairs. Michelle O'Neill reports their nest is located along Pool 13 of the Upper Mississippi River National Fish and Wildlife Refuge. Ed Britton, Manager of the Savanna district, says last year, the two males survived repeated attacks on the nest. But after one prolonged attack, the female eagle was severely injured and never returned to the nest. He says the eagle "dads" continued to raise the two eaglets, and they "fledged," or started flying, last spring. And a female has visited the nest and been accepted by the two males. Britton is obviously proud of the eagle family, which is famous in more than 70 countries thanks to the live feed from the webcam. He says the previous female eagle had a tendency to lay eggs early in late January or early February. So far, it seems the new "mom" may be on a more traditional schedule. The webcam is maintained by the Stewards of the Upper Mississippi River Refuge.